Mold is a problem for that has recently been the subject of many news and health investigations. Once unheard of, it is now an important concern for anyone who is purchasing a home. Be sure to investigate the following resources and educate yourself about the structural and health hazards mold and mildew can present. 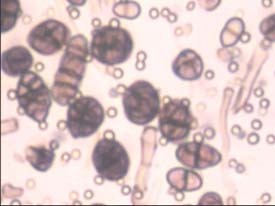 Close up of mold spores. "Molds have the potential to cause health problems. Molds produce allergens (substances that can cause allergic reactions), irritants, and in some cases, potentially toxi substances (mycotoxins)." "Indoor mold growth can and should be prevented or controlled by controlling moisture indoors. If there is mold growth in your home, you must clean up the mold and fix the water problem." 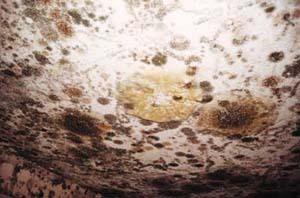 "Mold may be hidden in places such as the back side of dry wall, wallpaper, or paneling, the top side of ceiling tiles, the underside of carpets and pads, etc." From "A Brief Guide To Mold, Moisture and Your Home" issued by the EPA. PO Box 37133 Washington, DC 20013. 1(800)438-4318. U.S. GPO Superintendent of Documents, PO Box 371954, Pittsburgh, PA 15250-7954. Stock #055-000-00390-4. $24.00. Phone: 202-78-33238.